Michael Massey started his IMI Skill Auto journey as an apprentice training in NVQ Level3 Vehicle Accident Repair Paint Principles. He went on to win Chesterfield College Accident Repair Centre Apprentice of the Year in 2015 & 2016. 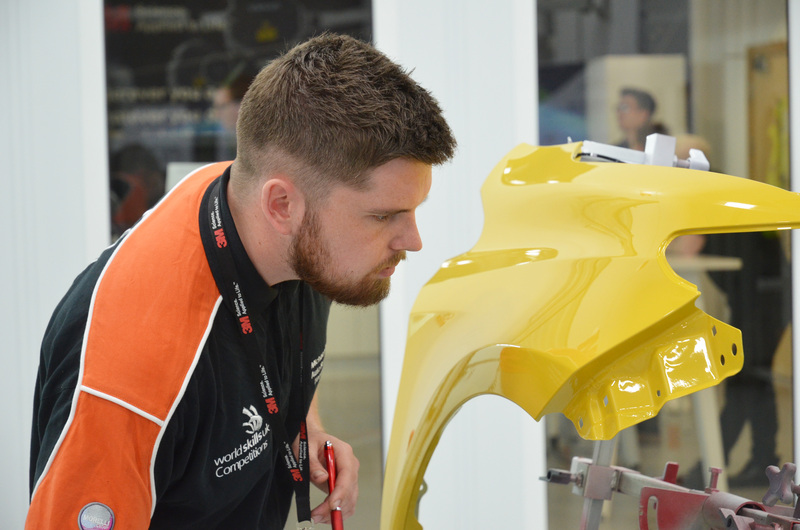 Michael’s tutors saw his potential and nominated him to take part in the IMI Skill Auto competition, by 2016 he was the World Skills UK Refinishing champion and is now back in 2018 as an IMI Skill Auto judge. Read on to find out more about his journey. “Whilst training at Chesterfield College I managed to secure myself an apprenticeship at Alton Cars in Ashbourne. This quickly paid off as my confidence and skills set soon began to improve and this didn’t go unnoticed. My tutors told me they thought that I was showing potential to compete in IMI Skill Auto at the World Skills UK competitions. They briefed me on the set up and how it would work and I was really interested in perusing it further. I understood that to be able to reach the finals there was a number of steps I had to take part in – the first being the online qualifier exam. The questions varied in difficulty but I scored enough to be put through into the regional qualifiers! 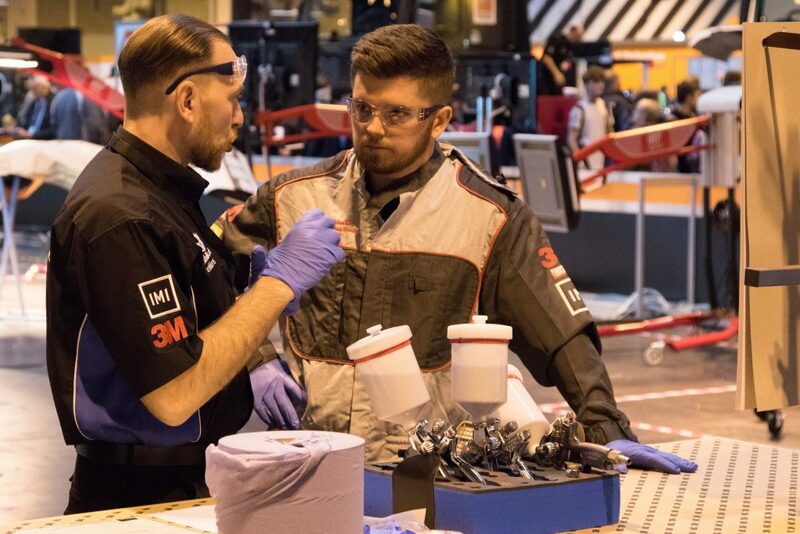 The regional qualifiers were to be held at 3M in Atherstone, Warwickshire; one of the most modern, clean and specialist refinishing centres the UK has to offer. The equipment and consumables we were welcome to use were top of the range, there was no excuse for poor quality work. After a number of refinishing tasks from painting panels, polishing, troubleshooting and fault finding equipment, I managed to score enough points to come 3rd out of 5 competitors on the day. I headed back to work at Alton Cars feeling fairly pleased and it had shown where I needed to improve. I spoke with my manager at the time and we put a plan together to try and upskill these areas, not only to benefit me, but the company too. August came and I’d missed a call from the IMI Skill Auto team. I quickly rushed outside where it was quiet to listen to the voicemail and it explained that I’d qualified for the finals! I was heading to the NEC to compete against the UK’s top trainee painters! In the following months building up to the finals I worked hard on improving my skills. Fortunately for me, my employers were very supportive and allowed me extra days to upskill at my college. It was soon November and time for the finals. After traveling around Birmingham in rush hour and 2 wrong hotel visits, I finally found the hotel I was staying in over the competition. We were competing over 3 days doing a range of specialist automotive refinishing tasks. Just to add to the pressure, we found out that there was going to be thousands of school children, college students and members of the public watching us compete. Once the competition had finished, I was very happy with my performance, knowing that I’d given it my all, I got suited up ready for the medal ceremony. Gobsmacked and speechless, I walked on stage to my name being read out as the Gold medallist. The winner! I had no idea the ripple effect this was going to have on my career. Since then, I returned to work and completed my apprenticeship. I worked hard on building bridges and making the most of opportunities given to me. I was also determined to create opportunities for myself. A mixture of magazine articles, online write ups and even an appearance on state at IBIS Ireland helped me try to make a name for myself. The more I said yes to, the more people I met and made connections with. Through this I was nominated for an Outstanding Individual Achievement award from the IMI and was also asked to be part of the IMI Skill Auto judging team, an honour. I delightfully accepted the role! I learned of a job opportunity at 3M in Atherstone through the IMI Competition Manager, David Massie. Where I had been both a competitor and more recently a judge at the competition. After numerous conversations, a job application form and an interview I received the amazing news that I got the job. I start my role in early October as an Application Engineer. I will be traveling around the country working with clients, implementing training, introducing new products into body shops and troubleshooting any customer issues. We would like to pass on our congratulations to Mike for his incredible success and thank him for his support, not only for the competitions but also his contribution to the industry.